His wife Annette beside him, Merlin Bullchild performs a traditional welcoming song. 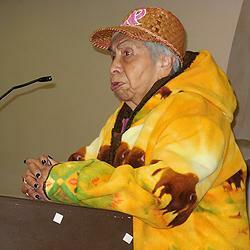 Zelma McCloud, Nisqually Tribal Elder. 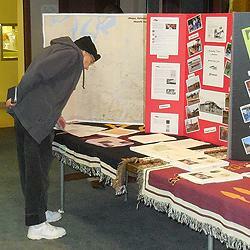 Audience member examines displays of tribal history and artifacts. The list goes on, but most of the names aren’t familiar to area residents unless they happen to know the Squally language. Annette Bullchild, Tribal Historical Preservation Officer for the Nisquallies, told members and guests of Lakewood Historical Society on Tuesday night, about the tribe’s on-going efforts to preserve its culture and pass along that history to future generations. One of the handouts available that evening featured a detailed map with original Nisqually tribal names for various places--such as Wy-at-chew (Lakewood), and Spootslith (American Lake). The name “Nisqually” was used by the Hudson’s Bay Company for its fort at the site of present-day DuPont. 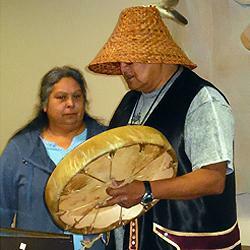 Tuesday, October 15, the inaugural outreach program began with a traditional tribal welcoming song. It’s the tribe’s hope that the presentation is the first of many, Bullchild explained, as she told about her role in carrying on the tribe’s historic preservation mission. Many are familiar with the late Cecilia Carpenter who long had been the Tribe’s historian and who worked diligently for the exoneration of Leschi, wrongly accused of murder. The program also included tribal artifacts and display boards tracing the Nisqually history, collecting oral traditions and stories from the past. The Tribe currently has between 500-600 members; its area extends from Olympia to Yelm, and Leschi was one of its most well-known leaders. Tribal elder Zelma McCloud, an Elder and Bullchild’s mother, spoke about the Tribe’s role in helping settle the Nisqually and Puyallup fishing rights dispute that resulted in the Boldt Decision of the 70s. Now they’re focusing on the Coal Train issue. The trains, when they operate, could possibly be crossing sacred lands. Today the Tribe focuses on recapturing its customs and traditions for its young people and instilling in them pride about their history. The current Canoe Journey that involves many of the area’s tribes is just one of the ways it accomplishes that goal. As part of its preservation efforts, the Tribe is hosting Nisqually History Day, from 3-5 p.m. on Friday, Nov.8 at the Tribal Youth Center. Visit the tribal website at www.nisqually.gov for directions and more information, or contact Bullchild at 360- 456-5221.